Chess never ceases to surprise us. Everybody and their mom complains that the game is getting younger all the time, with people becoming grand masters before they are out of kindergarten, and players over forty are duking it out for the world championship title. Incidentally, this is just the second time in the history of chess that this has happened. The first occasion was more than a hundred years ago, when Germany’s Emanuel Lasker, 40, and Siegbert Tarrasch, 46, competed for the crown in 1908. 41-year old Viswanathan Anand has been at the top of the chess world for twenty years now. Mysteriously, there has been a “Big Three” during all those years, with Anand invariably among them. At first it was Kasparov, Karpov, and Anand, then Kasparov, Anand, and Kramnik, then Anand, Kramnik, and Topalov, and now Anand, Carlsen, and Aronian. When he finished his professional career in 2005, Kasparov told Anand: “Now I’m leaving you in charge!” Kramnik also announced several days ago that he is planning to hang up the gloves, that is, put away the chessboard, but Anand is still playing and winning! Anand is a unique world champion, the only one to have won the title in three different formats, including the knockout, round robin, and two match wins against Vladimir Kramnik and Veselin Topalov. He is also unique in that he has always avoided the squabbles surrounding chess and has never tried to claim any special treatment for himself. That has earned him the respect of colleagues and chess fans alike. 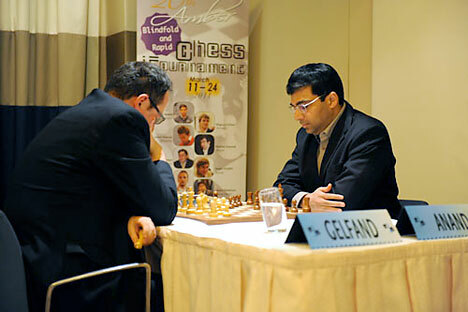 Gelfand was born in Belarus, then a part of the USSR. He moved to Israel in 1998, got married, and had a daughter and a son. He broke into the world chess elite quite a long time ago, in the early 1990s, but then experienced a slump. But Gelfand didn’t despair, just continued working and overcame the crisis. With all due respect for Gelfand’s talent, few believe he will be able to defeat “the Indian Wizard” and “the Tiger of Madras.” That said, their personal scores are more or less equal: Gelfand was ahead by five games until 1993, when Anand tied the score through 1997 and went on to gain a slight lead. At first it seemed that finding a sponsor for the match would be extremely difficult: at least one million dollars in prize money was needed, but even a highly suspenseful match can’t raise that much. As we know, the Topalov vs. Anand match was financed by the Bulgarians, and Anand was noble enough to agree to play on his opponent’s turf. Nothing of the sort could be expected of Israel, where chess in general and Boris Gelfand in particular are not very popular to begin with. However, help came unexpectedly when a private sponsor – a big chess fan from Moscow – offered to hold the match at a museum there. The question seemed to be settled when FIDE received a rival bid from Chennai, Anand’s hometown. Financially, it was even more attractive. But Moscow was very eager to host the match; the last time the city had the honor was a quarter of a century ago, when Garry Kasparov became the world champion after his second match with Karpov. It was the head of the Russian Chess Federation, President Dmitry Medvedev’s aide Arkady Dvorkovich, who helped find an additional sponsor. The prize fund increased to $2.55 million (not counting organizational expenses and FIDE dues), sealing the deal for Russia’s capital as the host city for the match. But the games will likely be held at the Pushkin Museum of Fine Arts. Vladimir Kramnik has confidently stated as much at a press conference in Moscow. He is expected to be a commentator at the match. Remarkably, it was in Russia’s capital that Anand and Gelfand met at a chessboard for the first time in 1989. They tied for the first and second places at a large tournament commemorating Alekhin at the House of Unions in 1992, defeated Russia’s national team at the Kremlin Palace of Congresses in 2002 as part of the world team, and in recent years have both won the Tal Memorial. Anand and Gelfand are always happy to return to our city, of which they both have the warmest memories.